They are one in the same! Just ask owner and operator, Kevin Morrison. He started from the restaurant bottom and now is here – owning a killer restaurant, with multiple locations across metro Denver. 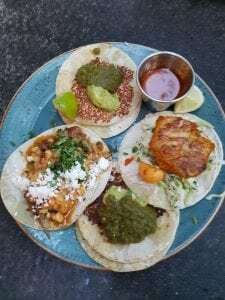 What started out as an Arizona food truck named “Pinche,” has transformed into a Denver brick and mortar staple, Tacos Tequila Whiskey, serving up authentic Mexican street food. STAR #1 = Hands down, the best tacos I have ever eaten. I’m a sucker for street tacos loaded with all the fixins’, which is exactly what we got. The vast menu made it hard to narrow down exactly what I wanted, but being a seafood lover, I opted to try the tempura shrimp taco and the fish n’ beer taco, which both were fried to perfection. 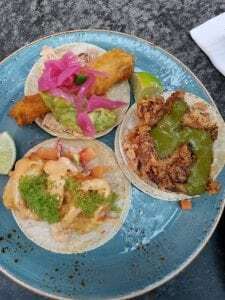 The shrimp taco housed Asian influences by adding wasabi drizzle and kimchi on top, while the fish n’ beer was a classic beer battered fish with avocado and pineapple. Both were insanely fresh, full of flavor and gorgeous in color. Branching a bit out of his comfort zone, my husband decided on the braised lamb, pork belly, and fried chicken taco to round out our meal, which was huge, delicious and filling! We both loved the juiciness of the lamb and tenderness of the pork belly – which melted in our mouths. Best part? All ingredients are local and true to their recipes, making all dishes authentic in flavor. Also offered on weekends: BRUNCH. The fun menu items can satisfy any craving. STAR #2 = Queso. Yes, this gets a star on its own for how amazing this dish was. 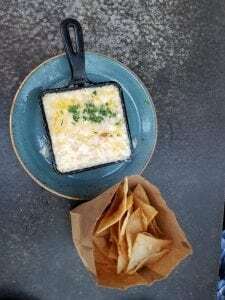 Because I have a ridiculously hard time turning down any type of cheese, we started with an order of the Queso Fundido al Tequila at the (highly praised) suggestion of our server. As soon as the bubbly creation arrived, we grabbed the house made chips and dug right in. Featuring melted Monterey Jack cheese, tomato, onion, tequila, and fresh cilantro (and house made chips! ), this dish tastes INSANELY awesome and 100% fresh! Melted cheese can be hit or miss, but this dish knocked my socks off. Want to add Asada or Hongos (mushrooms)? Go for it, for a mere $2. STAR #3 = The staff consists of all walks of life and everyone is involved in the process from start to finish. The sweet hostess greeted us with a smile and seated us at a cozy spot on the patio, while a young man delivered waters and silverware. Our server, Hannah, came up next and was very welcoming, accommodating, quick and made our experience wonderful. She checked back with us frequently and made light conversation, despite having the entire patio to serve at 7 PM. Another young man delivered our food and complimented the variety of tacos ordered and gave me a wink on his way out. Everyone we encountered were genuine, friendly and full of energy – creating the best type of environment. STAR #4 = All hail the cocktail! Wanting to provide a solid cocktail to match each dish, Kevin Morrison serves some of the best Tequila you can get your hands on and a wide variety of quality Whiskey. We sipped on fresh Paloma’s, which were light, fresh and the perfect shade of pink. 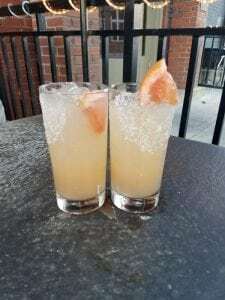 Featuring 100% Blue Agave Tequila, fresh grapefruit and lime, agave nectar and a splash of squirt, this drink was refreshing on a hot day, and perfectly accompanied our meal. Pours are strong, just how I like them, and the menu is vast. Pick anything – and you’re bound to like it. Trust me. Need another reason to stop by? Happy hour is from 3-6 PM nightly and all night long on Monday..
STAR #5 = Location, space and vibes! 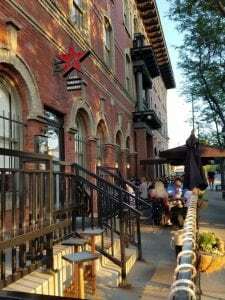 With three locations throughout the city (with slightly varying menu’s and vibes), this location seemed more intimate despite the traffic out front. Parking can be a bit tricky, as the back lot and street fills up fast, but park around the block and walk! Space is small, yet functional and well-laid out. The white strung lighted patio out front, makes for the perfect place to people watch and catch a city sunset. The interior, is a different story. Painted a deep red with rustic accents and Spanish décor, it feels purely authentic, which was their goal. Their history and fame splash the walls with local press and awards, making the perfect talking piece and only bringing more intrigue. NOW – I must admit enjoying this popular restaurant has quite the price tag. I was a bit shocked after seeing our bill but realized one must pay for greatness and happily forked over my credit card…and will continue again, and again. 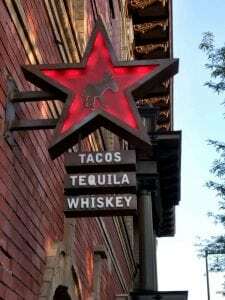 Thank you, Tacos Tequila Whiskey, for gracing us Denverite’s with your presence, as we’d be fools to not experience your “best damn tacos”!